A sphygmomanometer is an important device that is used to monitor and evaluate an individual’s health and blood pressure. Choosing a high-quality device can make a big difference when it comes to obtaining quick and correct readings on a daily basis. Santamedical Adult Deluxe Aneroid Sphygmomanometer with Stethoscope is one of the most affordable sphygmomanometer available in the market. 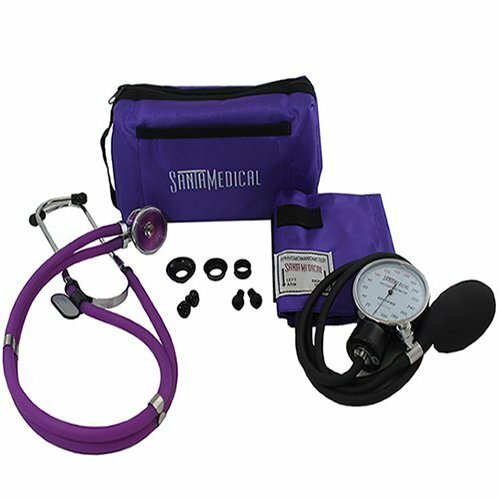 The pocket style sphygmomanometer is available a with black cuff and a matching storage or carrying case. Nylon cuff helps prevent mis-cuffing. The manometer exceeds the industry standards for accuracy. It is always advisable to buy the device from a reputed manufacturer so that you get value for the money. The cuff is made of nylon and is 21 inches long and 5 inches wide. The tubing is made of thick black rubber and is sturdy. Both the tubes are 19 inches long. The cuff is adult sized and can fit the right or left hand easily. The pressure bulb adds air to the bladder and this creates pressure. The rubber is a nice fit and fits comfortably in the hand. The thumbscrew is used to release the pressure and is easy to operate. The gauge made of solid metal is heavy. It has marking from 20 – 300 with small line divisions in measurements. The marking is large and easy to read. The packaging of the Santamedical Adult Deluxe Aneroid Sphygmomanometer is really good. The packaging box has images and basic specifications mentioned on it. A black zipped carrying bag ensures that everything is safe and secure during shipping. Inside the package, you find basic instructions on how to use the product. The sphygmomanometer has many unique features that has made it a popular choice among customers. Precision crafted aluminium manometer exceeds medical accuracy standards. This helps in providing the most accurate and reliable readings. The aluminium construction enhances the durability of the case. This enables you to use it error free for many years. Spring loaded air release valve makes it easy to use. Comfortable and durable nylon cuff. Stethoscope and carrying case included. Most of the sphygmomanometers available in the market don’t have a stethoscope and buying one can add to the cost of the device. Affordable, accurate and well made. Durable alloy and nylon construction. Velcro loses its grip over time. Reading Accuracy – The accuracy of the Sphygmomanometer is the most important factor that you need to consider. If the readings are not accurate all other things like comfort quick readings do not have any significance. Build Quality – The build quality and construction of the device needs to be checked. A good quality device can last for many years and provide accurate blood pressure readings on a daily basis. Comfortable Fit – The sphygmomanometer needs to fit comfortably, as this can help take accurate blood pressure measurements each time. Most of the models available in the market fit an arm circumference of 9 – 14 inches whereas some device models have been specifically designed for adults with large arms and for children. The Santamedical Adult Deluxe Aneroid Sphygmomanometer is considered one of the best manual blood pressure monitors available in the market. The accuracy driven design and solid construction make it definitely worth checking out. Read reviews so that you can get a complete understanding of the design, specifications, features and pros and cons of the product. This can help you make an informed choice. For more information about Santamedical Adult Deluxe Aneroid Sphygmomanometer with Stethoscope you can contact Gurin Products at (888) 666-1557.